SUSM: A Scenario-Based Urban Growth Simulation Model Using Remote Sensing Data adalah sebuah paper ilmiah dengan author Lakshmni N. Kantakumar, dkk yang dipublikasikan oleh Talyor & Francis. Paper ini dapat diunduh secara bebas karena bersifat open access. Sebagaimana diketahui bahwa EUROPEAN JOURNAL OF REMOTE SENSING merupakan journal open access sehingga bebas untuk diunduh. The introduction of the Foreign Direct Investment (FDI) policy in 1991 made India one of the fastest growing economies in the world. This has had a profound effect on India’s urbanization. The rapid urbanization of Indian cities poses a threat to natural and social environments, as expansion of the cities often outpaces the urban planning process. Thus, smart and strategic planning processes that use current and easily available datasets in combination with future urbanization scenarios are needed. 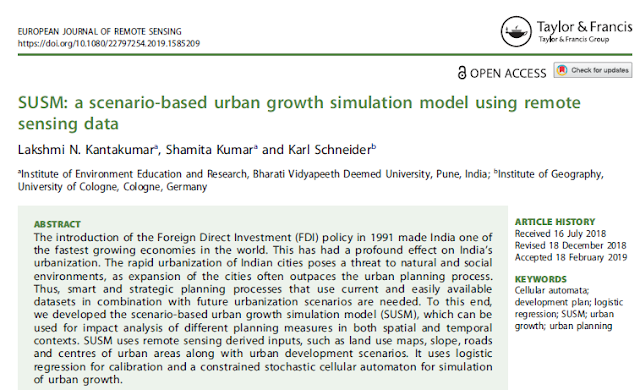 To this end, we developed the scenario-based urban growth simulation model (SUSM), which can be used for impact analysis of different planning measures in both spatial and temporal contexts. SUSM uses remote sensing derived inputs, such as land use maps, slope, roads and centres of urban areas along with urban development scenarios. It uses logistic regression for calibration and a constrained stochastic cellular automaton for simulation of urban growth. SUSM is tested in one of the fastest growing urban agglomerations of India: The Pune metropolis, which covers an area of 1642 km2. SUSM is calibrated using urban growth maps derived from LANDSAT satellite images from 1992 to 2001. 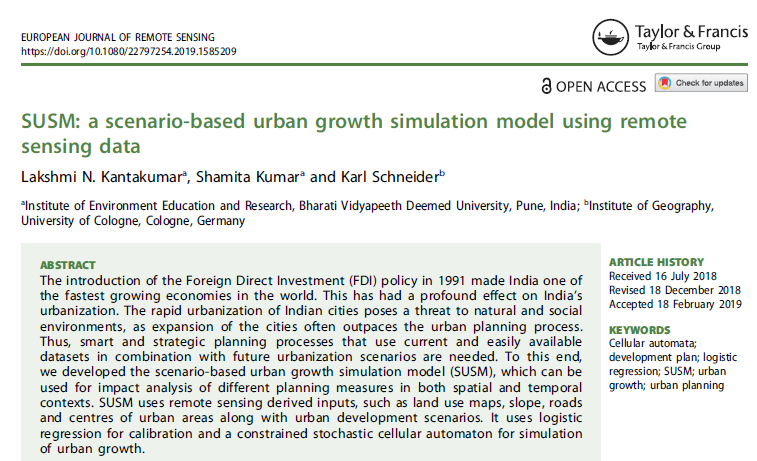 Subsequently, SUSM was used to simulate urban growth of Pune for 2013. A comparison of the SUSM simulation result with the actually measured urban growth derived from a LANDSAT 8 scene from 2013 is used to validate SUSM and to assess the effect of urban plans upon the growth of Pune. Our results show that: (i) SUSM is capable of predicting the location of future urbanization with an accuracy of 79% and a fuzzy kappa index of agreement 0.81; (ii) inclusion of official urban development plans as input for SUSM did not provide a better agreement with the observed growth; (iii) SUSM, parameterized with remote sensing data, can be used effectively to understand urban growth and assess the effects of alternative urban development plans in terms of the spatial expansion of cities.